It all started way back in Class 7. “Hey, you haven’t read the Percy Jackson series, ah?” - was the question that all my classmates and friends asked me. No. I didn't know any Percy Jackson. But it started there. I read the whole series, and finished it in Class 7. Then, I continued with my favourite friends, Percy and Annabeth, in the Heroes Of Olympus series. From that year on, I've been immediately reading the new releases- The Lost Hero, The Son Of Neptune, The Mark Of Athena and The House Of Hades, as eBooks. One of my classmates always makes sure it comes to me soon after the release. But this time- The Blood Of Olympus was already out. I assumed that I would get the eBook as usual. But not so. “Sorry! I don’t think I will be able to send this time!” was all that my classmate said. Ah! How was I going to get the book?! I had to read it! And- be one of the first people to have read it! Thanks to Eloor, our usual library, I got a copy of The Blood Of Olympus to read. I finished reading it, and travelled with the seven demigods to the end of the final battle with Gaia, after which everybody is peaceful and happy. Main Characters: Percy Jackson, Annabeth Chase, Piper McLean, Jason Grace, Leo Valdez, Hazel, Frank Zhang, Coach Hedge, Reyna, Hylla, Thalia, Zeus, Poseidon, Aphrodite, Apollo, Artemis, Athena, Ares, Asclepius, Victory, Octavian, Nico, Gaia, Giants. Percy, Annabeth, Jason, Leo, Piper, Hazel and Frank. They were the seven demigods chosen to defeat Gaia. But they had a problem with the prophecy. To storm or fire the world must fall- that presented a problem. This meant Jason, son of Zeus(god of storm and lightning) or Leo, the son of Hephaestus(god of fire), might die in the final battle So, the seven demigods set on three dangerous quests that would help them solve everything- they had to capture Victoria(the goddess of victory), they had to capture the war god Ares’s heartbeat from the Old Temple and they had to talk to Apollo and Artemis(the twin gods) into following them in the battle, and get the secret potion from Asclepius to make sure that Jason or Leo could be brought back alive even if they die. While capturing Victory, it becomes clear that Leo is going to die, because Victory screams at the Percy, Hazel, Frank and Leo, that one of them will die. But nothing is said about it. The magic medicine that they acquire from Asclepius is handed over to Piper to keep it in safety. The Gods and the Demigods together successfully defeat the giants. But while doing so, a drop of blood from both Annabeth and Percy seeps into the ground. The Blood Of Olympus has been given. Gaia awakes. Zeus blows the seven demigods to Camp- Half Blood. 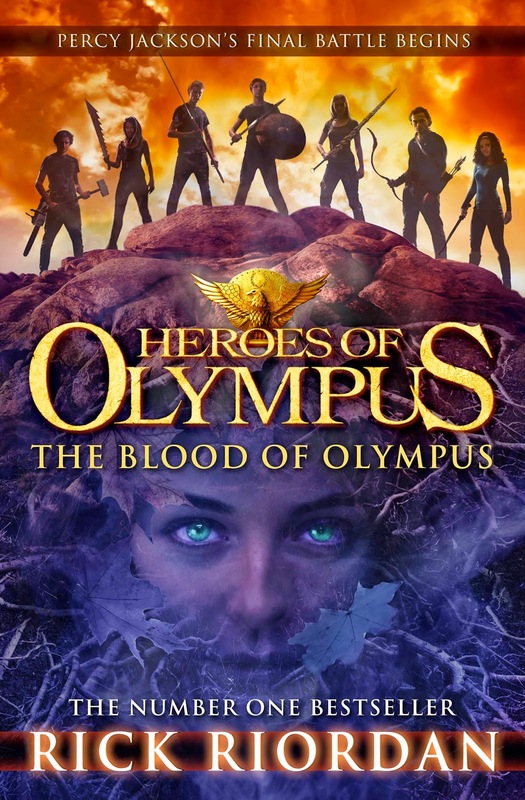 Meanwhile, Reyna, Nico, and Coach Hedge counter problems and finally reach Camp-Half Blood safely with the Athena Parthenos, only to find that Octavian(a Roman) is planning to war with the Greeks. But as Reyna arrives, and earns trust with the Greeks by giving back their sacred statue of Athena, the Romans stop following Octavian and listen to their old Praetor Reyna. The seven Demigods, the Roman and Greek forces together wage the war against Gaia. Finally, Leo takes Jason and Piper up into the air, where Piper charm-speaks Gaia into sleep-mode. Leo fires Gaia with all his strength. As heat builds up, and Leo understands that one of them must die, he pushes Jason and Piper from the war ship where they might die. Octavian launches himself on a missile to attack Gaia, in the name of saving Rome. Together, Leo’s fire and Octavian’s missile crumbles Gaia so much that she will never be able to reform again. But Leo’s warship, bursts into flames illuminating the whole sky. Everybody thinks Leo is dead and pray for him. Things slowly settle down. Greeks and Romans become friends. Peace prevails. But did Leo die? Of course not! He is the awesome guy who is “all about doing the impossible”. So, what happened to him? Read to find out. The book is really awesome. I am glad I was able to read it so soon. Did you pick up your copy?